We are proud to present the brand-new Jetpack Add-On Kit! The most affordable way to fly your own jetpack. This racing kit allows you to use your jetski / PWC as power unit. It is compatible to Sea-Doo, Yamaha and Kawasaki models. Our patented electronics (Pilot Throttle Control) will allow you to start / stop your jetski from the jetpack and control the throttle / power of your PWC´s engine. Our bidirectional communication is so far the best available electronics in the hydrosport industry. To make your flight as safe and easy as possible the system contains four different power levels and a kill switch. You will love our idea to provide you with a plug and play electronics – our connectors fit with your PWC connectors – NO cutting wires / NO soldering. Another advantage of our Jetpack-Addon-Kit is that you could upgrade the unit with all optional equipment like twinseat, remote control, ball bearing hose flange, jetpack stand and wireless control with a later purchase. Easy to own, easy to fly and an absolute highlight! You don´t buy only a Jetpack Add-On Kit, you will buy a new way of happiness. 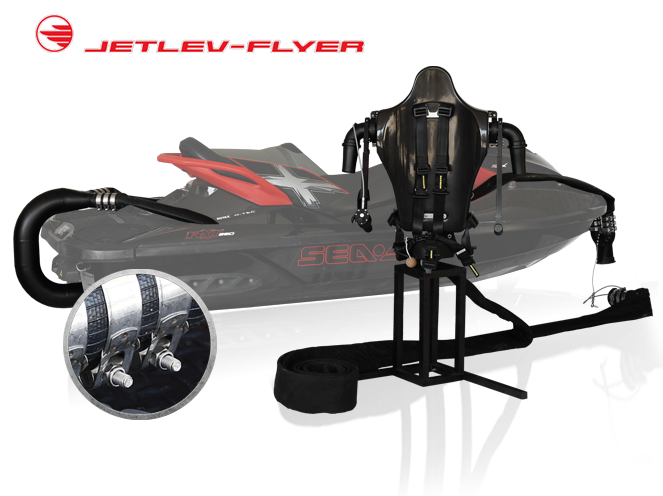 We are looking forward to welcome you in our Jetlev-Flyer family! Take a passenger with you. You don't buy only a Jetpack Add-On Kit, you will buy a new way of happiness.